The relationship between curiosity, imagination & happiness is inextricable. It’s kind of the internal engine everyone has <that just has to be gassed up & started>. I could add productivity <actual tangible output as proof> but that’s external, in other words, how can you build anything if you cannot imagine it first? If you put those two things together in your mind and just let it rest in there chugging away you will have a lot of fun in life. Because for everything you know there is some indefinable exponential amount of things remaining you don’t know <note: this can be frustrating to some people>. 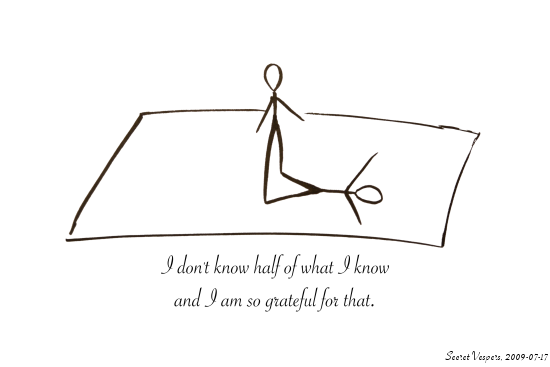 I have heard people in the business world say “I want to know everything there is to know on this topic.” I have often thought that was one of the silliest things anyone could ever say. You can know a lot. You can know enough to be dangerous. But knowledge is truly a bottomless pit. Even on one topic you probably don’t have enough hours in a lifetime to know everything there is. I guess that doesn’t mean you shouldn’t try, but, knowing what you know is good. Knowing you could know more is, well, even gooder. Knowing you want to know more all the time is the goodest I guess. Curiosity is one of the three things <resilience & persistence are the others> I tell young people is the secret to success. As long as you retain your curiosity and are always seeking to learn more in the attempt to sate it then you are well on your way to being successful if not just a more interesting person. 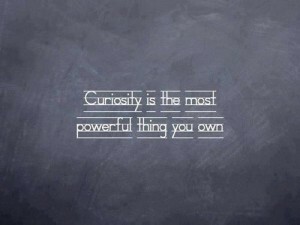 I would also suggest curiosity is the secret to a business’s success. The arc of ongoing business actions bends toward sameness & safe choice making therefore separation becomes everyone dancing on the head of the same pin where almost everyone feels compelled to try & dance in the middle of the pin head for fear of falling off. Edges are scary and, yet, where separation typically exists. I would suggest that even on a pin head the way off the mediocre middle is curiosity <which tends to guide you closer to an edge>. 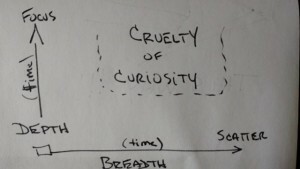 Beyond standing on the edge while I love discussing the rewards of curiosity, curiosity does come at a cost <just revisit Pandora’s Box if you need a reminder that curiosity often comes at a cost and, yet, offers benefit>. In a world in which we far too often assess cost versus benefit in almost everything we do, curiosity cannot be so easily assessed. The pursuit of curiosity is not simple. It can be as often a rocky road as it can be a smooth one. As a ‘lover of curiosity’ it almost pains me to type that curiosity embodies both pain and pleasure – sometimes not equally. Being incessantly curious translates into a constant restlessness. This can be incredibly painful to people who like construct & finishing things. they share their pain with you. In other words if you are constantly curious I can guarantee someone around you at all times will be sharing their pain with you. They came and he pushed. While you may like flying you have to be aware a shitload of people do not. If you want to fly in business you need to recognize in order for some to learn to fly they need to overcome fear. Recognize that the first step with just about everything in life contains at minimum a sliver of fear. And fear can be debilitating. 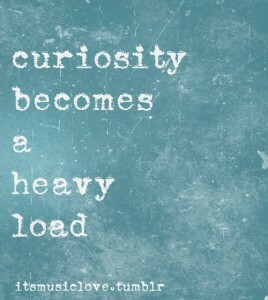 Curiosity stimulates the energy to move. And knowledge is the tantalizing prize. I say that because far too often we invest energy trying to overcome fear when we should be building value in the prize. I say that because knowledge has two benefits. 1st is wisdom that comes from sheer accumulation of new and different ideas & thinking. 2nd is, well, productivity. Yes. Early on in this piece I suggested it was an external factor and it is. In this case it is an output of curiosity. Not proof but just an output. Keep your eye on the prize. Show people the stars are too beautiful to ignore. I am a 100% curious guy and curiosity fuels me day in and day out. I would rather learn new things than eat or sleep. In general I think curiosity is good <an essential good>. I say that to suggest to my fellow curious companions that we have to assume a responsibility. A responsibility to understand that while we see the reward as worth the cost of the punishment curiosity sometimes hands out that many people just see the punishment. We need to accept the fact that, just as with the Pandora’s Box story, many people just hear of the pain & suffering that curiosity releases. To many, curiosity embodies risk and uncertain return. We should note that this does not make the curious risk-averse wrong … just, more often than not, more pragmatic with regard to their Life. The responsibility I bear as a curiosity lover is to understand the uncertainty many feel and not treat it with disdain but rather with hope. Hope I can show the reward. For, ultimately, if you believe the Pandora’s Box story … if there had been no curiosity there would be no Hope. Given that choice I would release the worst of the worst to insure Hope lived on. But it is my responsibility to not assume everyone sees curiosity as I do and understand that curiosity is sometimes a gift that needs explanation. And maybe that is what curiosity lovers need to do. Embrace Pandora’s Box internally and externally. I know I tell Pandora’s story again and again <and again>. I do so because far too many people do not know the end. And until they hear the end they may tend to lean toward believing too much curiosity only begets pain & suffering while I, when I see curiosity, see only Hope. Curiosity, to me, equals hope – to know something better than what I know now leading to being able to improve today with something better tomorrow.